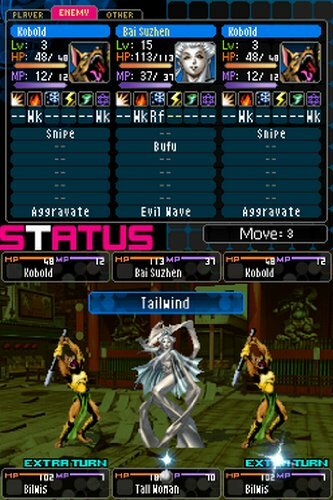 As the latest entry in Atlus’ long running Shin Megami Tensei JRPG series, Shin Megami Tensei: Devil Survivor saw a release in 2009 for the Nintendo DS. The game was localised and brought to North America, but never made it to PAL territories. Now, almost three years later, the sequel has ended up in the same situation. Fortunately, the DS is a region-free console, and you can easily import a copy. 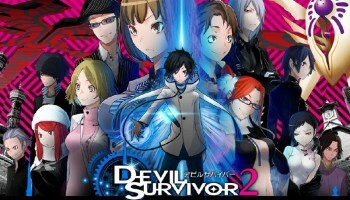 Now, I’d be lying if we said that Shin Megami Tensei: Devil Survivor 2 is an ambitious sequel. However, when you consider that the first game was a very enjoyable, well-received game, this isn’t an entirely bad thing. As the saying goes, “if it ‘aint broke, don’t fix it”. Atlus seem to be firm believers in that principle, and Devil Survivor 2 does a good job of supporting it. To be blunt, there’s plenty of re-use of assets, and the game doesn’t really try to hide it. Most NPC artwork, some locations, and the majority of the demons have been taken straight from the first game. As such, the game’s graphics are on the exact same level as the original’s. Despite this, the game manages to put on a good show of its own. Just as in the first game, demons are invading Japan and causing complete chaos. The country burns as these monsters attack. This time around though, a bunch of mysterious creatures are appearing and wiping out humanity with relative ease. Are they demons, or something worse? It’s up to your team of young heroes to investigate, and save the day. Unlike the first game, which was restricted to the city of Tokyo, you’ll be travelling all over Japan to fight. To assist you on your mission, Devil Survivor 2 has a much larger selection of party members than its predecessor. Twelve people will be joining you in your fight, with an even mix of males vs. females. A couple of them look a little weird, and they can tend to come across as a little over-the-top in the design department, but they’re all quite likeable in their own way due to their unique personalities. They range from Airi, a serious, contemplative woman, to Joe, a young man, who is almost constantly cracking jokes. Like the first game, Devil Survivor 2‘s battle system is essentially a cross between that of a Strategy RPG (such as Disgaea) and a First-Person Dungeon Crawler (such as the Etrian Odyssey games). What this means is that you’ll be navigating a grid-based map and moving your characters a few spaces at a time. However, when you initiate an attack against an enemy’s team, your view switches to a screen that displays your selected enemies right in front of you. All teams, both yours and the enemy’s, consist of three members – one of which is designated to be the leader. In order to effectively damage the leader, you need to first knock out their fellow team members by picking them off with focused attacks. This is an essential tactic for progressing through the game, but it remains optional, you can simply target the leader if you wish. You’ll receive less experience points, but will usually take less damage in return. Two of your team members will be demons, whom you’ve tamed and brought into battle. They can either be bought via an auction system, or fused together to form new, more powerful creatures. Characters and demons are displayed as small, low-detailed sprites on the grid-based map, but full, highly detailed artwork is shown during battle. As such, the game’s graphics are a bit of a mixed bag. There’s very little animation, with the game preferring to focus on showing off static, detailed artwork. It’s a look that mostly works for the game, but can come off as a little disappointing, since we know that the DS is capable of more. Buying and fusing stronger and stronger demons, then testing out their new skills on your enemies is always enjoyable, and you’ll be doing plenty of it if you want to survive. Most battles play out quite similarly, with each team trying to hammer the other with the elemental skills that the other is weak to. This can get repetitive, but the game’s pacing makes up for this quite well. Between battles, you’ll get to engage in many conversations and events with your party members. There’s over a hundred of these in the game, so many that you can’t even see them all in a single playthrough. Just as in Persona 3 & 4, each event consumes a certain amount of time, so choosing who you want to spend time with carefully is important. There’s a limited amount of time in each day, and each half-hour block is precious. 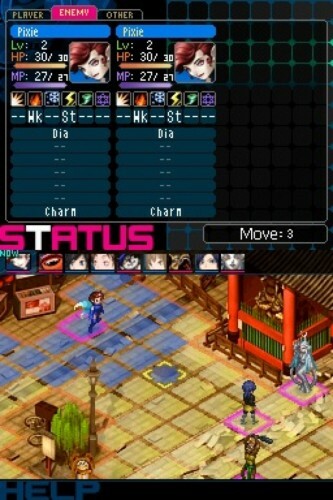 Devil Survivor 2 introduces a brand new Fate Point system, which is comparable to the Persona series’ Social Links. Spending time with a particular character, and choosing the right responses, will cause your bond with them to level up. As is the case with Persona 3 & 4, this allows them to unlock new abilities, such as resistance to certain elemental attacks. It will also affect which ending you get, as Devil Survivor 2 features five different ones to see. One of the best elements of the game is that, unlike most JRPGs, your party members’ skills are completely customisable. You have total control over which skills they learn, and in what combination they use them. You can even change them around or transfer them to other party members at will. This system relies on the Skill Crack mechanism, carried over from the first game. Skill Crack begins at the start of each battle, where you can choose which skills you’d like to learn from your enemies. Each party member can only learn one new skill per battle, but since you can re-assign their skills as you see fit, this isn’t much of a limitation. Once a skill is learned by defeating the particular enemy, it is added to the move pool that every party member has access to. Skill Cracking has been enhanced in the sequel, with party members who have a high enough Fate Level being able to perform a Dual Skill Crack. This allows your character to share Skill Cracks with their companions, so that if one of them dies during battle, the other can still defeat the enemy and learn their chosen skill. Surprisingly, despite having a very similar setting to that of the original, Devil Survivor 2 has an overall lighter tone to it. There’s even a couple of comical tracks mixed into the soundtrack, which play during light-hearted scenes. The game’s background music is fairly simple, but can be catchy, and it suits the game perfectly. The rather hard-edged music of the first game has been replaced by some slightly lighter tunes, and they all sound great without getting too repetitive. Like the first game, there’s absolutely no voice acting though, which is a little unfortunate. It would have been a nice touch. The original Devil Survivor offered players a few funny lines to say, but the game was very dark on the whole. Tying into the Fate Point system, your character has a lot more dialogue choices compared to the first game. Your character’s personality can change dramatically depending on which options you choose, ranging from a total jerk to a completely selfless nice guy. There’s lots of funny lines for you to mess around with as well, and some of the characters’ responses can be quite amusing. For the most part, these choices don’t have any significant impact on the game’s story, but having some extra input is appreciated. It helps to make you feel as though you’re a part of the game’s world. 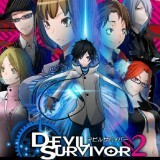 Overall, Shin Megami Tensei: Devil Survivor 2 is a solid follow up to the original game. Despite the re-use of many assets, the game’s story proves to be just as engaging as its predecessor’s, and you really feel as though you get to know the characters as you battle to save humanity. The gameplay is enjoyable, with a nice balance of battles and social events. With a single playthrough lasting for about 30 hours, you’ll certainly be getting your money’s worth. There’s an excellent amount of replay value, as the game has multiple endings, and a New Game Plus system which allows players to carry over many things from their first run. There are also exclusive bosses that can only be fought during a second playthrough. The game can get quite difficult at times though, so if you’re not up for a strong challenge, then the game may frustrate you a little. 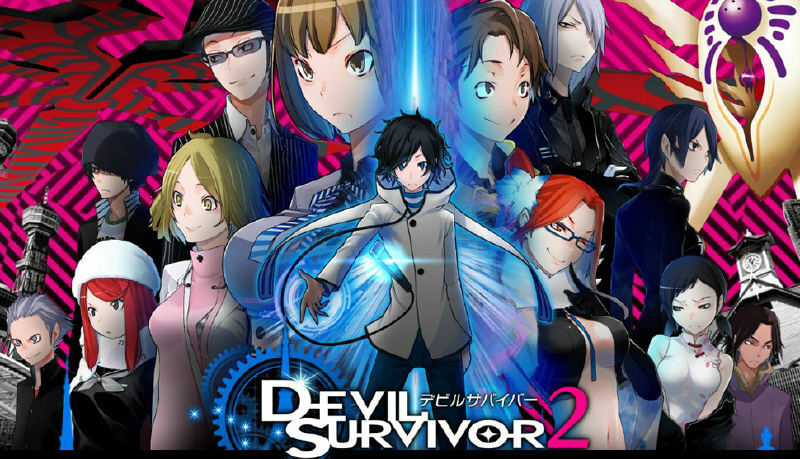 If you enjoyed the first game though, there’s really no reason why you wouldn’t like Devil Survivor 2. If you’re new to the series, and aren’t afraid of a JRPG that offers a challenge and requires a fair bit of strategy, then the game will at least be an interesting experience. Featuring a clever mix of Tactical RPG and First-Person Dungeon Crawler gameplay, Devil Survivor 2 has what it takes to be different from most JRPGs on the market. As such, it’s a game that’s easy to recommend, even for those who haven’t played a Shin Megami game before.